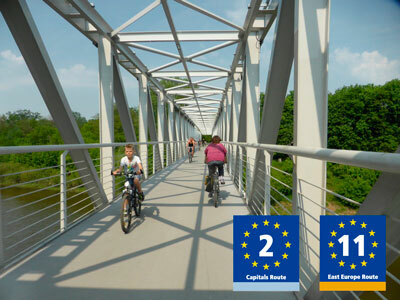 In December 2018, the Mazowieckie Voivoidship adopted a new land-use planincluding updated itineraries for EuroVelo 2 – Capitals Route and EuroVelo 11 – East Europe Route in the region. This is very good news for EuroVelo as it shows political recognition of the European Cycle Route Network in Poland! Mazowieckie Voivoidship is the largest of the 16 Polish provinces, and also the most populous. It is the province of the national capital Warsaw and of some other important Polish cities, such as Radom and Plock. Despite the density of population, the Mazowieckie Voivoidship is also known for its greenery: forests cover over 20% of the voivodeship’s area, where pines and oaks predominate in the regional landscape. Additionally, the Kampinos National Park located within this province is a UNESCO-designated biosphere reserve. All in all, it is a beautiful area to explore by bike on EuroVelo 2 or EuroVelo 11. Looking to ensure effective communication of the cycling routes in the Mazowieckie Voivoidship, this new land-use plan identifies several categories in the province’s backbone network of bicycle routes: international, supra-regional and regional. The international cycling routes are formed by two routes that form part of the EuroVelo network: EuroVelo 2 – Capitals Route that crosses Poland from West to East, from the German-Polish border, through Poznań, Warsaw and towards Belarus along the Warszawa-Tłuszcz railway line, and EuroVelo 11 – East Europe Route that goes from the Polish-Lithuanian border towards the south, through Warsaw and along the Vistula River to Slovakia. We can see that the EuroVelo routes are fully included in the province’s land-use plan, creating a connection between daily bicycle commutes and longer journeys by bike. Furthermore, the plan recognizes that infrastructure is a decisive factor for tourism development, and that the EuroVelo routes play an important role in developing the tourism potential of the province. In order to ensure the construction of quality cycle routes, the plan defines some criteria that are consistent with the EuroVelo European Certification Standard, such as the separation between the bicycle path and the road in areas with a high traffic (exceeding 10,000 vehicles per day) and the conditions of acceptability of side bicycle lanes and mixed traffic. We hope that these updated itineraries and promotion of the EuroVelo network in Poland will be followed by investing in development of the routes. This is turn will encourage more people to explore their region, their country or even to go beyond the border by bicycle. You can find out more about the Mazowieckie Voivoidship by visiting their website: www.mazovia.pl.